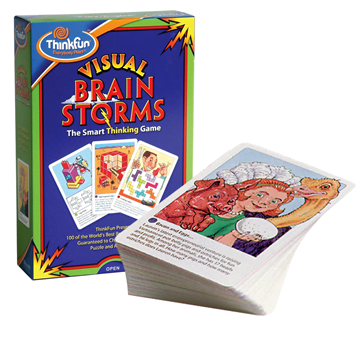 This stack of cards includes 100 zany brain-teasing challenges that will keep minds of all ages thinking “fun.” Visual puzzles, logic problems, mazes, math challenges, encoded messages, and more will test and amuse players for hours. Visual Brainstorms offers solutions to each problem—plus Bonus Questions on every card for twice the fun and challenge. At home or on the go, these Visual Brainstorms offer a mental workout that can’t be beat.